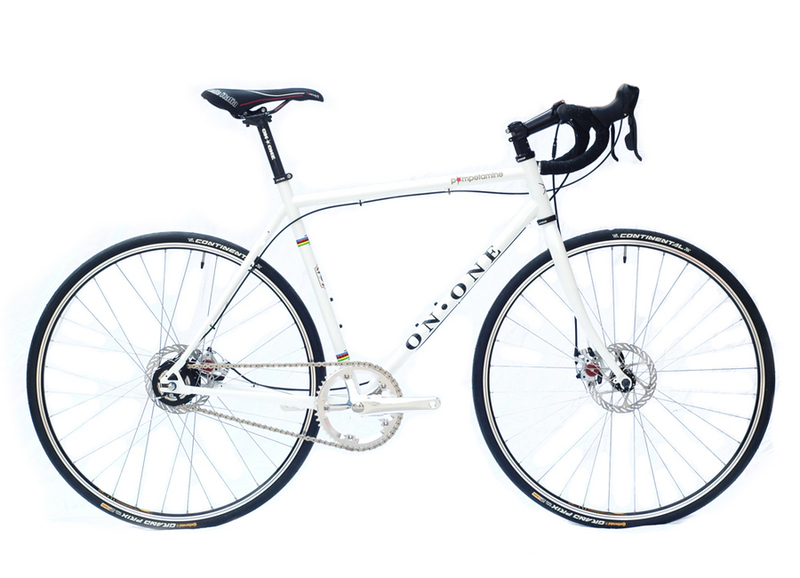 Not one but TWO models of On-One’s legendary single speed road frame landed at Bike Science Bristol this week. Model 1 – Keep it simple. Fixed gear “urban” build. Flat bars, fixed gear, fat tyres and oodles of style. Everything you need for the ultimate no-nonsense city run around. “Sterling Moss” green finish. Model 2 – Nothing but the best! The ultimate in practicality and luxury. A disc brake version of the legendary Pompino. Specced with Alfine hub gear and unique Versa VRS-8 drop bar Alfine shifters. Finished in classic white. We can supply any current model as specified on the On-One website (at the same prices), customised to suit your exact requirements. Why not treat yourself to the ultimate guilty pleasure this Christmas? This entry was posted on Saturday, December 4th, 2010 at 7:50 am	and is filed under All Posts, Bike Fitting, On-One Bikes, Products. You can follow any responses to this entry through the RSS 2.0 feed. Both comments and pings are currently closed.